Q3: Is POINTE, CLAW a love story? In POINTE, CLAW, I wanted to explore intimate female friendships and the way in which the lines between friend and lover can shift and blur. Friendships between women can have a depth and an intensity that is really remarkable. In a “typical” love story (whatever that is), attraction often comes first. There’s surging physical electricity that compels two people to want to spend time together and to want to know each other better. But the reverse can be true as well. Friendship can deepen and emotional intimacy can lead to attraction and then physical intimacy. The relationship between Jessie and Dawn in POINTE, CLAW is intense. They knew each other as children and reconnect on the verge of adulthood. They careen back together when each is at an absolutely crucial moment that will determine the course of the rest of their lives. The deep connection they share drives the choices they make moving forward. In my mind, it is a love story, although not in the way you might think. 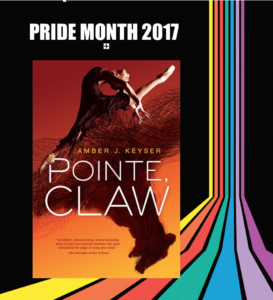 I don’t want to say more for risk of spoilers, but let me just say that I was really happy to see POINTE, CLAW recommended by The Horn Book as a love story for Pride Month. Reviewer Katie Bircher called the book an “intense nonlinear exploration of love and loss.” Read more here.